Sicily is the largest island in the Mediterranean, it also sits right in the center of the Mediterranean Sea and serves as a connector for both Europe and Africa, and the Western and Eastern Mediterranean trade systems. It was not long before both the Phoenicians and Greeks began to colonize the island. The Phoenicians colonized the Western portion of the island. Dorian Greeks, mainly from Megara, Corinth, Rhodes, and Crete, concentrated their settlements in the Southeastern portion of the island, whilst the Ionian Greeks settled in the Northeast. 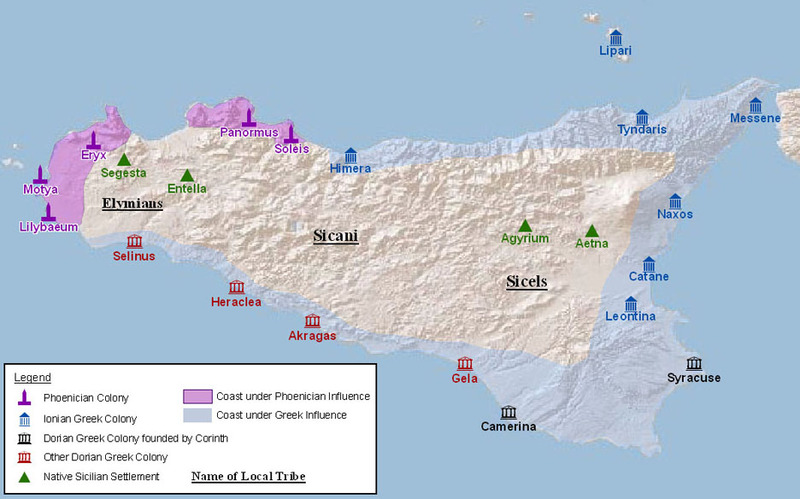 The original inhabitants of the island were divided into three main tribal groups, the Elymians, the Sicani, and the Sicels. Through trade and cultural exchange, the native groups gradually took on more and more traits of the colonizing cultures, too such a degree that the ruins of native Sicilian settlements such as Segesta, with its pillared temple and theatre are virtually indistinguishable from Greek ruins.